CPAV6890 for the Agilent 6890 or 7820 GC with its standard split splitless injector. CPAV7890 for the Agilent 7890 GC with its standard split splitless or MMI injectors. CPAV1177 for the Varian/Bruker/Scion 3800, 3900, 450 and 430 GCs with their standard 1177 split splitless injector. A. Sample Introduction for Mass Spectrometry - Cost Effective Probe. Lower cost than standard MS probe. Faster, easier and simpler operation and ChromatoProbe to GC-MS interchange. Do not contaminate the MS ion source. Inherently immune against leaks and thus can be operated by untrained personnel and students. Can be used for the delivery of high mass MS calibration compounds such as C20F42 for optimized tuning of the 5975 MSD. In this case the ChromatoProbe can be used behind the standard 30 meter column. 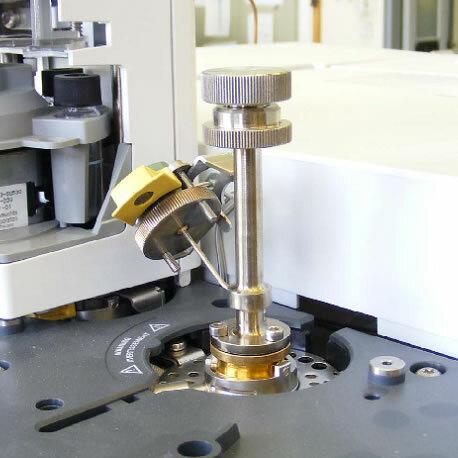 Such MS tuning is needed for optimal analysis of samples at the 800-1050 amu range. The ChromatoProbe vial has 2.4 mm ID hence it is much bigger and easier to work with and load samples into it than with the much smaller vials of standard MS probes. It can also be used with samples in solutions. The ChromatoProbe transferline can also be connected into the ion source simultaneously with a T union connector (available by Agilent and a few other vendors). In this case when not in use the 1 meter transfer line can be maintained with minimal flow rate (such as 0.1 ml/min) and with cold injector to eliminate its effect on the standard analysis, and ChromatoProbe-standard analysis can be quickly and automatically interchanged by the method alone. B. Extract-Free Dirty Sample Introduction for GC and/or GC-MS Analysis. Sampling is performed in the small disposable vial (provided) that retains the harmful and non-volatile matrix residue and thus eliminates the need for extended sample clean-up. Accordingly, the ChromatoProbe serves as a low cost manual thermal desorption unit with excellent GC integrity. Note that a temperature programmable injector (MMI) is needed for working with extracts and samples in solvents in order to eliminate intra injector splashing. Alternatively, the solvent in the ChromatoProbe vials could be vaporized prior to its insertion with the ChromatoProbe. This ChromatoProbe mode possesses the following major advantages in its chromatographic sampling mode. Lower cost of analysis due to reduced (or no) sample preparation. Complex small solid or sludge samples such as bacteria, tissue, gland, plant material, hair, blood, urine, silicone tube, PDMS, SPE powder, TLC powder, SnifProbe trapping columns, crude oil and blended food items can be analyzed (solvents require prior off-line vaporization or a PTV/MMI injector). Efficient thermal extraction. The excellent GC integrity enables high thermal extraction recoveries. Higher sensitivity is enabled through the sampling of large volume concentrated extracts (with PTV/MMI injector). Please read the relevant literature for your application in http://www.tau.ac.il/chemistry/amirav/dsi.shtml or consult Aviv Analytical about your specific application in case of doubt.